CTI WELCOMED A NEW COHORT OF SCHOLARS IN January 2019, WITH THE Continuation OF THE 2018-19 RESEARCH WORKSHOP ON RELIGION & VIOLENCE. Top Row: Richard Davis (Pacific Theological College), Joshua Mauldin (Assistant Director of CTI), Peter Ochs (University of Virginia), Christine Schliesser (Zurich University), Mark Eaton (Azusa Pacific University), Willem Drees (Tilburg University). Bottom Row: William Storrar (Director of CTI), Pauline Kollontai (York St. John University), Etin Anwar (Hobart and William Smith Colleges), Joel Hodge (Australian Catholic University), Paul Middleton (University of Chester). CTI Holds Joint Symposium on Religion & Violence with the Center for the Study of Religion, Princeton University. Members in CTI’s Research Workshop participated in a December 7 Symposium on Religion & Violence held in co-operation with Princeton University’s Center for the Study of Religion. 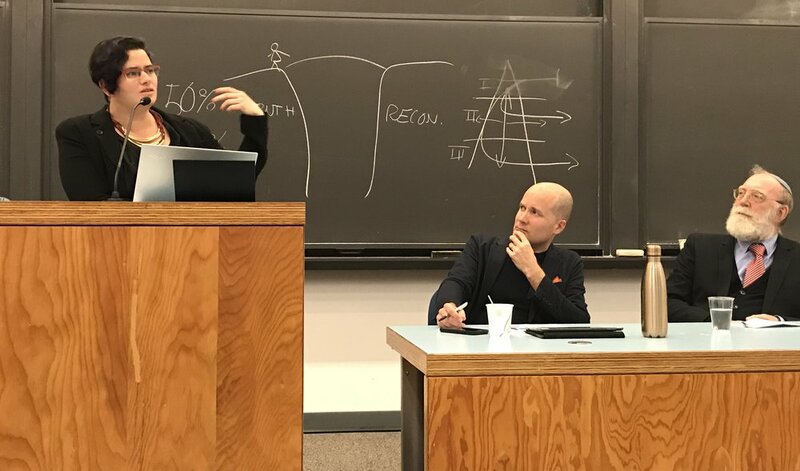 This event was an occasion for CTI workshop members to present their work in progress on religion and violence in a public forum, in conversation with respondents from Princeton University. Pictured above, left to right: Tanya Zion-Waldoks (Visiting Fellow, Center for the Study of Religion, Princeton University), Antti Pentikäinen (Executive Director, Network for Religious and Traditional Peacemakers, Finland, and CTI Member), and Ephraim Meir, (Professor of Modern Jewish Philosophy, Bar-Ilan University, Israel, and CTI Member. CTI member Andreas Losch returned to Luce Hall in October 2018 to present his work at the Center. Losch was a member of CTI’s Inquiry on the Societal Implications of Astrobiology. Joining the lunchtime discussion were current CTI members along with scientists Ed Turner (Princeton University) and Michael Hecht (Princeton University), as well as Frederick Simmons, also a member of the Inquiry on the Societal Implications of Astrobiology. Albert Raboteau joined CTI members for a book discussion on his 2016 book American Prophets: Seven Religious Radicals & Their Struggle for Social and Political Justice. Raboteau is the Henry W. Putnam Professor of Religion Emeritus at Princeton University. His research and teaching have focused on American Catholic history, African-American religious movements and currently he is working on the place of beauty in the history of Eastern and Western Christian Spirituality. José Casanova visited CTI in September 2018 for a lunchtime seminar with CTI members. Professor Casanova is one of the world's top scholars in the sociology of religion. He is a professor at the Department of Sociology at Georgetown University, where he also heads a Program on Globalization, Religion and the Secular at the Berkley Center for Religion, Peace & World Affairs. CTI welcomed a new cohort of scholars in August 2018, with the launch of the 2018-19 research workshop on Religion & Violence. Top Row: Antti Pentikäinen (Network for Religious and Traditional Peacemakers), Ephraim Meir (Bar-Ilan University), Wolfgang Palaver (University of Innsbruck), Louise Du Toit (Stellenbosch University), David Tombs (University of Otago), Ed Noort (University of Groningen). Bottom Row: Joshua Mauldin (Assistant Director at CTI), William Storrar (Director of CTI), Hannah Strømmen (University of Chichester), Elisabet Le Roux (Stellenbosch University).